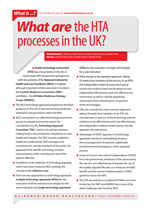 What are the HTA processes in the UK? | Whatis Series...? Health technology assessment (HTA) has a long history in the UK. In recent years, HTA has become synonymous with the activities of the National Institute for Health and Care Excellence (NICE) in England, although important entities also exist in Scotland (Scottish Medicines Consortium [SMC]) and Wales (All Wales Medicines Strategy Group [AWMSG]). The NICE technology appraisal (TA) programme develops guidance on the use of new and existing medicines, treatments and procedures within the NHS. NICE commissions so-called technology assessment groups to prepare assessment reports for consideration by the Technology Appraisal Committee (TAC), which is the primary decision-making body in the production of guidance on new health technologies. The TAC includes academics, healthcare professionals, NHS managers and commissioners, and lay members of the public; the appraisal of the specific technology includes representatives of the companies and of the patients affected. Guidelines on the methods of TA, which have been issued by NICE, embody the concept of the reference case. There are two approaches to TAs: multiple technology appraisals (MTAs) for the evaluation of all the relevant technologies for the same indication and single technology appraisals (STAs) for the evaluation of single technologies for a sole indication. MTAs started as the standard approach, taking 54 weeks from process initiation. In an MTA, the independent evidence assessment group reviews the evidence base and develops its own independent effectiveness and cost-effectiveness assessment, as well as critically appraising submissions from companies. STAs are currently the most common approach, taking 37 weeks from initiation. In an STA, the company submits evidence on the technology’s effectiveness and cost-effectiveness; the independent evidence review group critically appraises the submission. Advantages of NICE’s approach to TAs include its methodological rigour, the encouragement of extensive stakeholder involvement and transparency of the appraisal process. Issues of concern are a lack of independence of NICE from the government, timeliness of the assessments, the use of a cost-effectiveness threshold, the use of the quality-adjusted life-year as a measure of health benefit and the uneven implementation of NICE guidance across the NHS.